Now Open! This is What it’s All About! We are thrilled that our new office in Helena is now open. After months of dreaming, sweating, inventing, painting, cleaning, and coming up with some crazy ideas, the historic Nunnally House in Old Town Helena has been rescued back to its rightful personality. The Ribbon Cutting, Grand Opening, Open Houses, and first few meetings are in the books, and we have been blown away with the warm reception from the local community, and the encouragement from colleagues and friends all over Birmingham. But the reception that has meant the most to us came from the most important source: the Nunnally family, themselves. The night before the Ribbon Cutting, we were honored to host several descendants of Grace and Luther Nunnally, who came to gather, remember, and to see the renovations we’ve done on a house that was their family home for generations. As they were appreciating every detail, from the preserved barn wood, to the upcycled dresser, to the beams and the planks and the bricks, it dawned on us: this is why we are in this business. We do this to help match families with homes they can fill up with memories, just like the Nunnally family did here, for many decades. 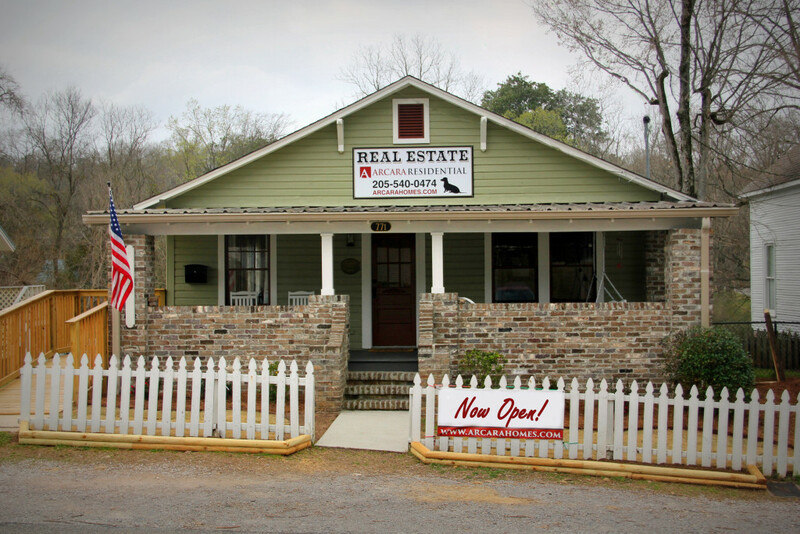 When you come visit us at the Nunnally House, you will see a great deal of our heart on the walls; almost everything has a special story or meaning to us. 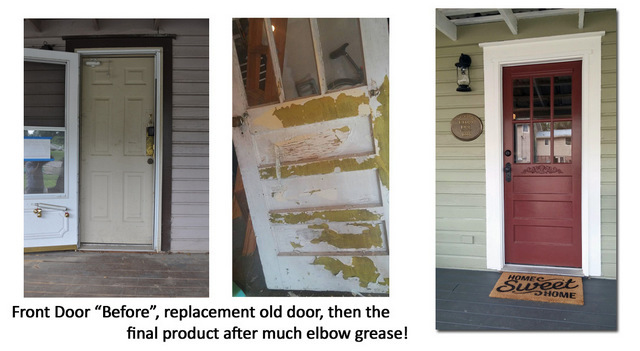 Below are some of the before and after photos along with a explanations. This home was Greg’s idea, from the color scheme to the architectural details; he had a vision to start with the bones of the house, preserving everything possible and adding features with character and personality. He didn’t let the grime or termite rot cloud his excitement, he just plowed ahead! But Greg didn’t do this along; enormous thanks are due to many people: Bill Carroll, our great contractor; Tammy Taylor, our very own “JoJo Gaines”; Ron Bardo and Michael Hebert; Bill Garner, who turned nail-ridden planks into treasures; our son, Matt, for his sweat equity; and above all our families for giving us encouragement and the type of help that really counts. Come see us! And don’t forget– when you need a Realtor to help you with buying or selling your home anywhere in the Birmingham metropolitan area, we are the team you want to call! We have figured out what the fuss is all about, and it’s worth it. “>Seeing the photos is rewarding; the home was crumbling and sad; it had suffered from being abandoned and under appreciated. Nothing a little TLC couldn’t fix! 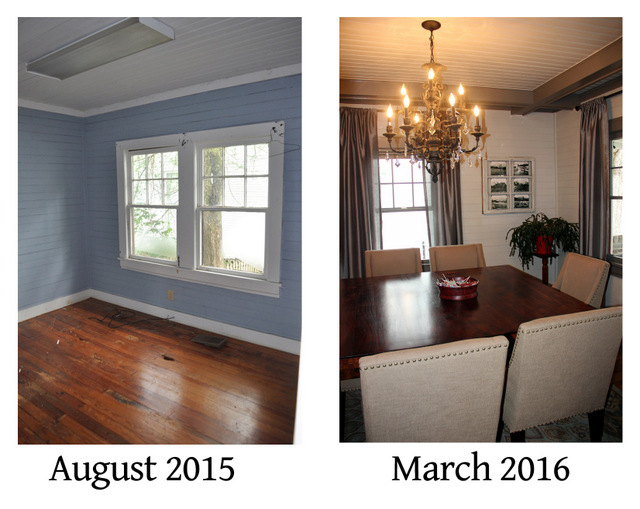 Besides the improvements on the outside, we worked room by room to restore the home into a functional space for an office, but one that didn’t hide from its heritage as a family home. One of the things we love most about the house is the big front porch, a throwback to the porches our grandparents enjoyed. Already we have discovered that the porch beckons for many reasons; conversation with a neighbor, a breather from stress, a great place to take a phone call, a place to have a burger, even a place to hold a business meeting. When we started, the porch was structurally sound, but mainly just very nasty; it also had large, faded puzzle pieces painted on the floor. We painted the porch floor with Sherwin William’s Super Deck in gray, pressure washed the bricks and sidewalk with the help of Splash!, and Greg had our amazing contractor, Bill Carroll, add a few architecture touches, such as creating larger columns and adding corbels. 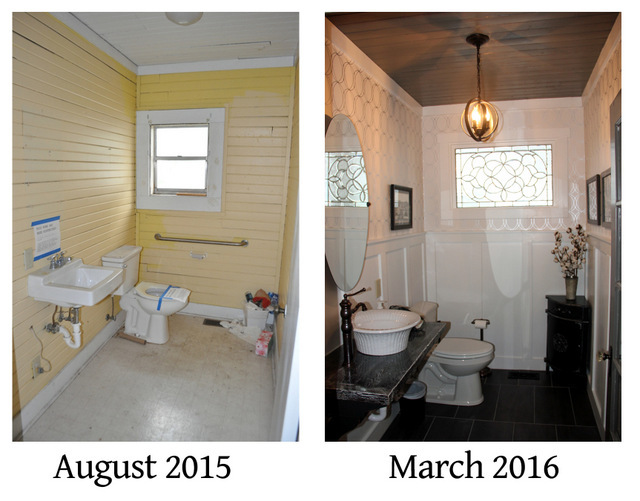 We discovered along the way that everything you do when preserving an old house involves time and patience! For example, the front door. Who would think it would take so many day just to gain a proper door? What a pleasure it was to brighten up the inside. Painting the paneling a light color, (Sherwin Williams Accessible Beige), gave a great palette to use dark gray for the beams and trim. With the more neutral palette, the decorator touches that have special meaning for us are able to stand out, such as the sliding barn door created from wood we rescued from a kitchen wall in the house, repurposed old windows from the house being use as frames for photos and specially chosen pieces that double as art and homages to our heritage. We named the conference room “Biggy’s Room” after Grace Nunnally’s pet name from her grandchildren, and within that room we tried to remember all the great things about Helena. The one room Greg decided to “gut” was the bathroom. Somehow, the ability to see daylight straight through from the kitchen, through the bathroom, and into the conference room didn’t bode well for this preservation minded team; so with all rules of engagement called off, Greg came up with a great design, and did the work himself! The bathroom counter was repurposed from the old floor joists we pulled out from under the house; we thought the room would be a great place to display the original photographs of the home’s aftermath in the 1933 tornado. After all, the bathroom is the safe spot in the Nunnally House, according to James Spann’s guidelines. 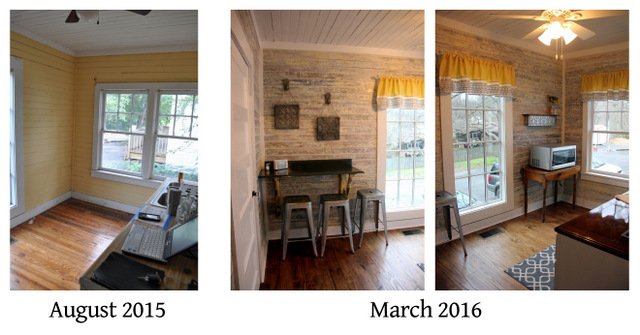 What fun it was to transform the kitchen! We tried to take it from a dark, dingy old mess into a cheery reminder of our grandmothers’ kitchens, yellow and white and waiting for a good meal to be cooked. Thankfully, we are in no short supply of amazing restaurants nearby, but the kitchen is now a nicely restored break room. When you get a chance, come on by and say hello. We would love to know what you think!